Immediately following the final whistle the Mercer Island Islanders boys soccer team made a beeline for the middle of the field celebrating the most crucial victory of the 2017 season to date. 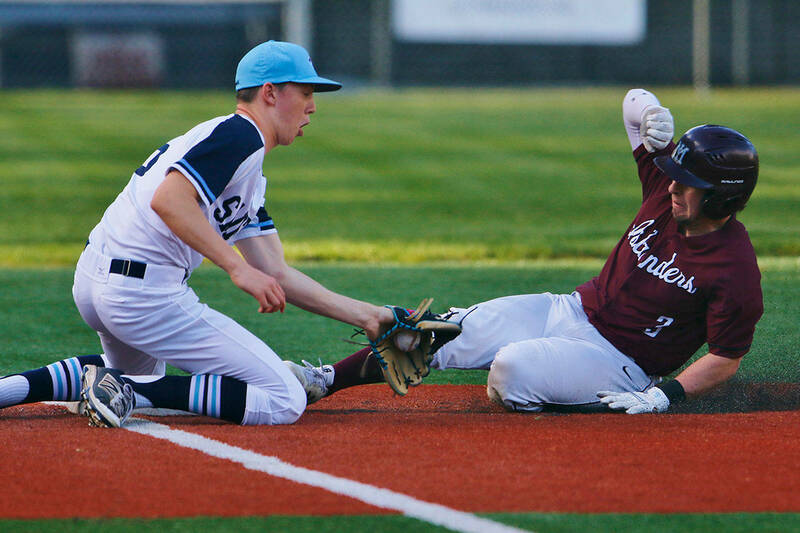 The Islanders clinched a berth at the Class 3A state tournament courtesy of a dramatic 2-1 win against the Lake Washington Kangaroos in the KingCo championship game on May 6 at Mercer Island High School. The Islanders, who lost to the Kangaroos 4-3 on May 2, were thrilled to avenge their recent defeat with a berth in the state tournament on the line. Mercer Island senior Lucas Meek said the recent setback against Lake Washington was on his team’s mind in the days leading up to the showdown. The matchup between the Islanders and Kangaroos was extremely physical. Multiple yellow cards were doled out by the officials in the pressure packed contest between rivals. Mercer Island bolted out to a 1-0 lead with a Hunter Bauman goal in the ninth minute of play. Bauman’s goal, which came from 20 yards out, was perfectly placed just above the outstretched arms of Lake Washington goalie Jamison Gunhus and hit the back of the net just under the crossbar. In the 16th minute of play, Lake Washington senior midfielder Baptiste Debuire tied the game at 1-1 with a goal on a free kick from 45 yards out. The long-range goal curved into the upper left corner of the net. With just nine minutes left in regulation, Islanders’ junior midfielder Mitchell Meade scored after receiving a perfect pass off of a corner-kick, giving the Islanders a 2-1 lead. Meade wasn’t surprised the Islanders scored the game-winning goal on a corner-kick. “We practice corners all the time. We try to get as hyped as we can before them. That is where we put all of our energy because that is where we know we can win the ball. I was just anticipating it and it dropped right into me,” Meade said of the pass. Lake Washington didn’t flinch after Mercer Island got the go-ahead goal. In the final nine minutes the Kangaroos put constant pressure on the Islanders defense in an attempt to force overtime. The Islanders defense was able to fend off the Kangaroos rally to preserve the victory. Lake Washington will face the Interlake Saints in a loser-out playoff game on May 9. Kangaroos head coach Rod Smith is confident his team will rebound from the loss against Mercer Island. “It is just on to the next one [game]. We try to approach every game the same which is to go 1-0. It is about the game in front of us. That is our focus and it will be no different. We will have a good day of training [Monday, May 8] and we’ll come out prepared and focused to take on Interlake,” Smith said. The Islanders will get some much needed rest in anticipation of the Class 3A state tournament. The first round is slated to begin between May 15-17. “We will be resting up and trying to get better and work on our play. We had some games where we didn’t play our style and we’re really trying to solidify that,” Meade said. The state tournament may be right around the corner, but the Islanders were enjoying the moment in front of their hometown fans on Saturday night. “It is purely emotional for all of us. It was just 80 minutes of pure passion. It is just incredible stuff,” Meade said. Mercer Island head coach Colin Rigby was jovial following the victory. “It is a very rewarding feeling. Everybody that is part of this team is fully bought in. They respect everything that has happened in the past [tradition] but they want to make an identity for themselves. This is a great way to do it. These moments certainly gives us momentum leading into the state tournament,” Rigby said.